Thirsty Pilgrim: Brewpub. Pizzeria. What's Not to Like? Much is made of beer pairings these days. Roast duck with your abbey dubbel? Escabeche with your oude geuze? OK. But how about pizza and beer, dude? Beer and pizza. Pizza and beer. A few slices of pepperoni, liberally sprinkled with your hot sauce of choice, washed down with a large, cool glass of your favored hoppy pale ale. That is powerful, life-affirming stuff. 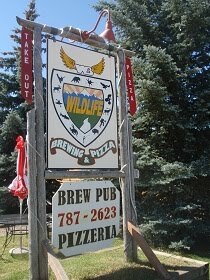 Sadly, we weren't able to investigate Wildlife Brewing & Pizza on last summer's cross coutry trek. We made the scenic drive from Jackson, Wyoming, to Victor, Idaho, in the late morning. We visited Grand Teton's pub and hoped to hit Wildlife for lunch, just a couple of blocks away. No luck there. Not open until 4 p.m., and we had to get back. So... all reports welcome. How many brewpubs are out there offering the usual burgers? Fish and chips? Club sandwiches? I mean, I dig on all those things. Sure. But they're ubiquitous. Brewpub-pizzeria. Shouldn't there be more of those? OK, there are tons of brewpubs that sell pizza. Most of them also sell burgers and nachos and reubens and whatever the hell else they can think of. Specialize. Put beer on one pedestal, pizza on another, and that's it. Anyway. That's what I'd do. Writing from Italy, this is one really hot topic. You can easily find a good pizza over here, but how about a good pizzeria that sells good beer? Ah, that's challenging: for most of the people (both customers and restaurateurs) the equation is "a macro lager goes with whichever kind of pizza". But things are slightly a-changing. Another point is that it's difficult to find a brewpub selling proper pizzas: looks like if you want a food menu you have to cook complex dishes to be paired with your beer. Well, nothing could be more wrong. Should have known an Italian would weigh in! As for "a macro lager goes with whichever kind of pizza," the annoying thing is that this is often true... even when a more flavorful beer might enhance the experience. When I was researching the Brussels book a few years ago I had a vivid dream in which I found an excellent pizza joint in St-Gilles with a prolific list of biéres artisanales. Alas, it was just a dream. It was tough to find a good pizza in Brussels, let alone one with something besides Jupiler or Maes. A Duvel if you were lucky.